I love this sauce! 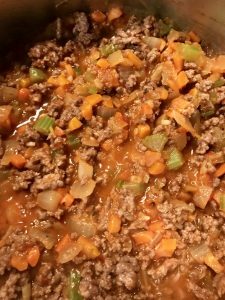 It requires a little more time and a few more ingredients than your traditional meat sauce, however the loads of veggies (and flavor) makes me feel less guilty about how much of it I eat. Also it’s close enough to spaghetti to please even the pickiest of eaters. The real key to this recipe is very simple, time, you want to let this sauce cook low and slow and magical things will happen. 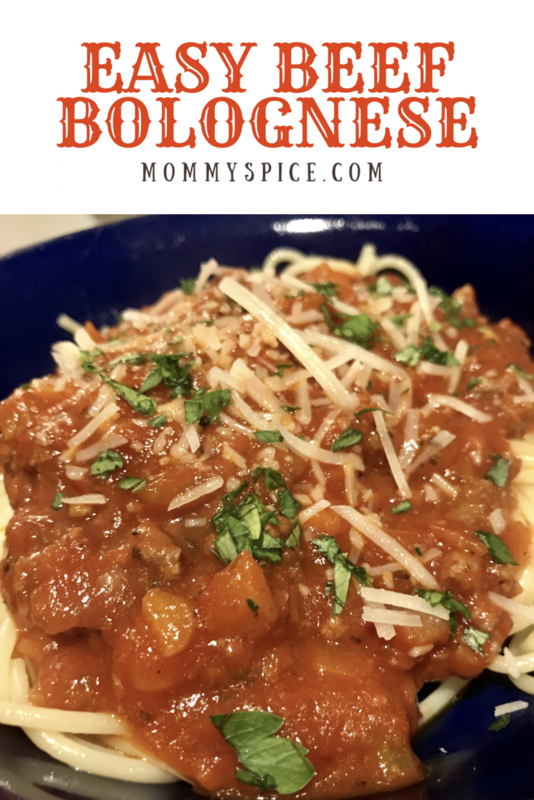 Now the easy part of the title comes from my use of jarred marinara sauce, if you have a favorite go to jar, this is the perfect way to bulk that up but keep with the base flavor you already have come to know and love. 1 box, pasta of your choice, cooked al dente. Brown your hamburger meat with a healthy pinch of salt and crushed red pepper, breaking it up finely. While your hamburger is cooking, chop up all of your veggies. Heat olive oil in a large pot over medium, medium high heat. Add onions, celery and carrots, sprinkle with salt and sauté 5-7 minutes, stirring occasionally. Add garlic, stir until fragrant, one minute should do. Pour your cooked hamburger meat into the pot and stir to combine. Next add the jar of marinara and bring the sauce mixture to a low boil, reduce to a simmer and let it cook uncovered 20-30 minutes, stirring occasionally. During that time cook your pasta to al dente reserving 1/4 cup of pasta water. Pasta water is one of those ingredients that you don’t even realize you have. It’s so starchy and can be used to either thicken or loosen a sauce. I do this with all of my sauces, it’s a great little trick for home cooks to have. Now in this case you may not need the full 1/4 cup of pasta water, it’s really a matter of how you like your bolognese. If you prefer more of a ragu consistency you can skip this step all together. I usually like to thin ours out a little bit, however add a splash at a time to see what works best for you. 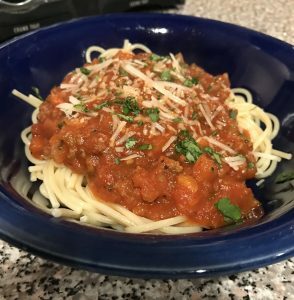 Now it’s time to top your warm pasta with your oh so yummy bolognese and garnish with lots of fresh parmesan and parsley. This one is always a hit around my house, all 3 kids eat it up and ask for seconds or even leftovers the next day. Plus it’s loaded with veggies and I just love sneaking extras into things they love. Adding all the veggies also means you don’t have to use as much meat which is budget friendly! My tip for this one is if you are a vegetarian you can use one head of cauliflower finely chopped in a food processor in place of the hamburger meat. You would just add the cauliflower in with the other vegetables in the recipe.